England got their Euro 2020 qualifying campaign off to a winning start against the Czech Republic at Wembley on Friday night, as Raheem Sterling starred with a deserved hat-trick. Gareth Southgate's side had a youthful outlook, and his faith in his younger players was not misplaced; a number of them putting in strong performances. Jadon Sancho was lively down England's left flank and provided the assist for Raheem Sterling's opener in his first competitive international start. Harry Kane blasted in a penalty on the stroke of half time after Sterling was clattered by two Czechs in the box, giving the Three Lions some breathing room at the break. England continued their strong performance in the second half with Sterling completing his hat-trick before being replaced by Callum Hudson-Odoi for the latter's first senior cap. The fluidity of England's front three was startling, especially considering that this was just Sancho's fourth cap for the senior team. He linked up sublimely with Kane and Sterling, and will provide Southgate much food for thought when Marcus Rashford is fit. The three combined well for Sterling's opener, with Kane beautifully disguising his pass to Sancho before the youngster crossed for Sterling to slide in at the back post for a tap in. It's a goal that Sterling has scored on countless occasions for Manchester City this season and Southgate will have had his forwards working on that on the training ground. For a while England lacked a truly threatening, cohesive attacking unit but now, their front three looks exciting, and above all potent. If Sancho continues his projected trajectory, a trio of Kane, Sterling and Sancho with backup provided by Rashford and Callum Hudson-Odoi will terrify any opposition England face. Things are looking bright for England. Starting XI: Pickford (6); Walker (8), Keane (6), Maguire (7), Chilwell (7); Alli (7), Dier (5), Henderson (7); Sancho (9), Kane (8), Sterling (10*). Substitutions: Barkley (7), Rice (6), Hudson-Odoi (7). Raheem Sterling ran the visitors ragged with his pace and trickery on Friday night. He was criticised for not finding the net regularly for England, especially at last year's World Cup but made no mistake here as he scored three fabulous goals. For Manchester City this season, Sterling has been on fire and many England fans were hoping he could bring that to international duty. In this game, he showed why he has been one of City's star performers as he opened the scoring and won the penalty which Kane scored. He then scored his second goal with a perfectly struck strike and capped off a great performance with a well deserved third. 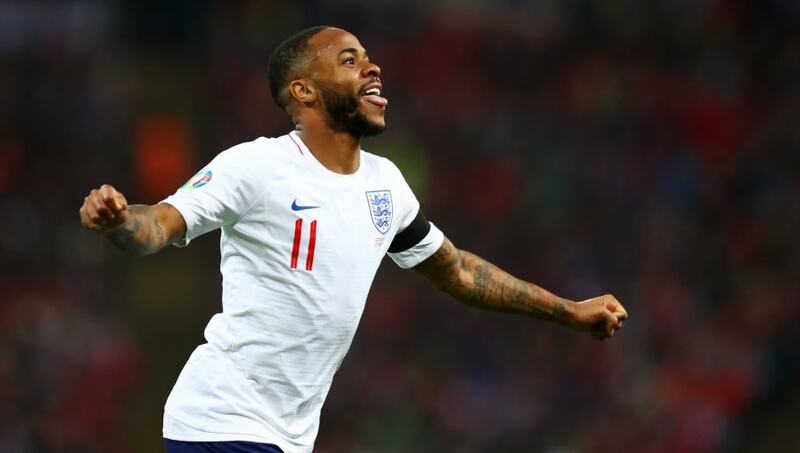 ​The Three Lions will need Sterling at the top of his game in the summer if they are to triumph at the Nations League finals, and if he continues as he is, he will be a key part of England's team in Portugal, and for the foreseeable future. Starting XI: Pavlenka (5); Kaderabek (5), Celustka (5), Kalas (6), Novak (5); Soucek (6), Pavelka (6), Gebre Selassie (5), Darida (7), Jankto (5); Schick (7). Substitutions: Vydra (6), Masopust (5), Skoda (5). Patrik Schick was always going to be the Czech Republic's main threat and, despite not receiving brilliant service, showed some flashes of brilliance. He looked the most likely of the visitors to beat Jordan Pickford in the England goal and manager Jaroslav Šilhavý will look to the 23-year-old to provide the cutting edge in their qualifying campaign as they aim to reach the European Championships in 2020. England face Montenegro in their next Euro 2020 qualifier. Southgate will take many positives from game against the Czech Republic, especially the performances of his younger players, and another good performance in Montenegro will put England in a good place ahead of the finals of the Nations League in the summer.